Anna, when did you graduate from YHS and describe your career journey? I graduated in 2003. My journey really started at PwC in the CRM and Customer Experience space for the Advisory line of business. I shifted into more in-depth growth programs such as Sales, Marketing, and Insight Methodologies across consulting and technology, more recently heading up the Professional Services Team for EMEA and co-leading the Global team at LinkedIn. My current work, post-Microsoft acquisition of LinkedIn, has been advising existing startup advisory work and a shift into supporting consultancy to enterprise businesses around operations and digital brand. It has been both refreshing and challenging to be my own boss for a few months. 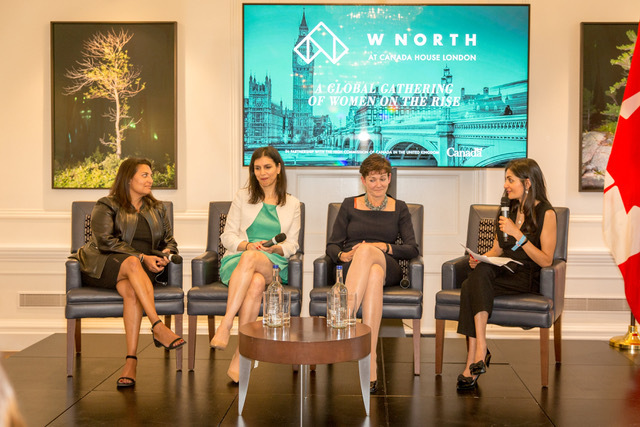 Parallel to paid work, I volunteered my time and expertise to WNORTH’s London launch which has been an invaluable personal and professional enhancing experience. We were very pleased to have you at YHS last year when you gave a presentation on building your digital brand online. Where are you currently working? I am currently a freelance consultant, about to incorporate my services under the name Cocoon Advisory Limited. While I have not ruled out going ‘back’ to a large tech business, I have thoroughly enjoyed the day to day mixed engagements across startup world and enterprise world. Drawing energy from how I impact people and organizations, my more popular workshops have been presentation skills: verbal and written as well as my two-hour business priorities focus group. You’re now based in the UK; do you get an opportunity to connect with other YHS Alumnae? Being based in London has allowed me to have close Yorkie friends nearby, as well as forging new links such as getting to learn from the fabulous and incredibly insightful Shirin Foroutan from the Class of 1994. 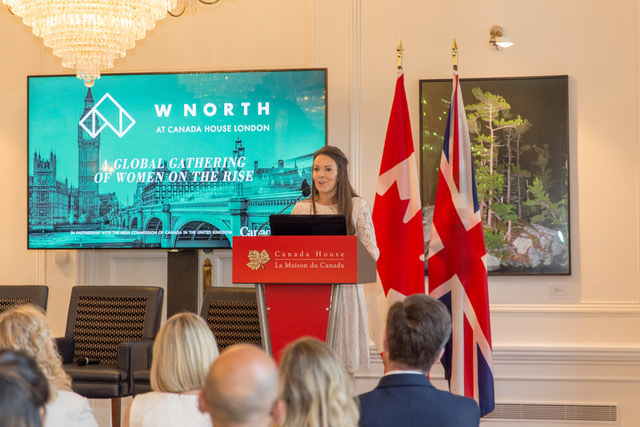 Shirin recently kindly agreed to speak at the London Launch of WNORTH on June 14th at Canada House . Shirin was and is everything we talk about when it comes to true leadership – a true role model. I felt proud to call Shirin my friend, and someone who could be so impressive and yet so approachable. The power of the YHS Network. You’re passionate about women in leadership and empowering other women. Tell us a little more about that professional journey. I believe that the future of cities, of business and of living is through a healthy dose of diversity of thought. More recently the UK Government required that businesses report on their gender pay gap. I don’t think this is simply a matter of pay, this challenge goes deep into a multi-faceted problem. Drawing on societal norms and the early days of education, socialization of how boys and girls are supported through their schooling has played a huge role in what core skills are represented when we class students by gender. And from schooling all the way to talent pipeline and progression in the working world, lacking skill sets has led to gender dominated industries, a challenge that means diversity of thought is not available let alone championed. Gender is just one part of the conversation, and in fact, as a society, we need to be more open minded and welcoming to all makeups of people. Recognizing unconscious bias is the start to that conversation and if I can be someone that changes my language for the betterment of my community and someone that leads by example, diversity of thought should be a thread we weave throughout our systems for a better together future. We paired you successfully with a young alumna, Mercedes Fogarassy from the Class of 2013 who was interested in the same career path. How has that mentorship relationship evolved? Working with Mercedes has been rewarding. I am a mentor to her just as much as she is to me. Reverse mentorship is the key to someone who is experienced but needs a fresh outlook on how the marketplace is changing. We, Mercedes and I, learn equal amounts as we share in depth conversations about career pathing, skills development and goals (both personal and professional). We have a healthy balance of open/honest and constructive work alongside the more emotional side of how we grow as people. I have loved the YHS link to Mercedes as so many of my other mentee/mentor relationships have been derived from my workplace (a slightly different commercial focus) and/or family-friends (a much more personally-geared mentorship. When are you back in Vancouver again? I am hoping to be back again in September for a fellow Yorkie’s wedding and some potential client meetings. The beautiful part about supporting global and multinational businesses is that travel and mobile working go hand in hand, allowing for some good personal visits paired with knowledge and skills of how to adapt to how different regions do business. ‘Always be learning’ was said a lot at LinkedIn and traveling for work and pleasure allows that to be my reality.